Justice Joyce Abdulmaleek of the Federal High Court, Ibadan, on Wednesday granted N10 million bail to each of the five defendants arraigned in the alleged N8 billion currency scam. Those granted bail are Ishaq Akano, Ayodele Festus, Hakeem Oyebamiji, Ayodeji Alese and Sunday Ajuwe. In her ruling, Abdulmaleek held that the defendants had been languishing in Agodi Prison since 2015 because their counsel were unable to convince the court that they would not jump bail. “However, in their latest bail applications, their counsel were able to make certain changes, hence the need to grant them bail,” she said. Abdulmaleek also ordered each defendant to provide two reliable sureties who must be resident in Ibadan as part of the bail conditions. She, however, discharged Kayode Philip-Togun, the third defendant, from the case after the EFCC counsel Mr Adebisi Adeniyi, told her that another Judge had convicted him in a sister case in which he was involved. “The anti-graft commission had considered it necessary to drop further charges against Philip-Togun because he had been convicted in a sister case. “Therefore, we pray my lord to withdraw Philip-Togun from further prosecution in all other cases which he is involved because he has been convicted in one of the cases. “This is in accordance with Section 108 of the Administration of Criminal Justice Act (ACJA) 2015,’’ Adeniyi said. The News Agency of Nigeria (NAN) reports that Akano, Ayodele, Oyebamiji, Alese and Ajuwe broke into jubilation as the court granted them bail. 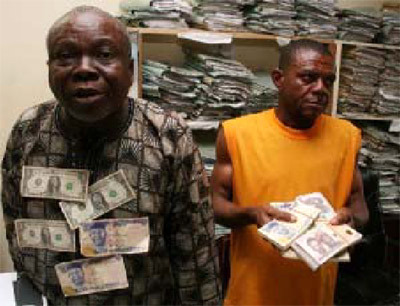 NAN recalls that the defendants had since 2015 been facing multiple charges bordering on conspiracy, unlawful conversion, forgery, stealing and recirculation of mutilated currency at the Ibadan branch of the Central Bank of Nigeria. Mr Sikiru Adebayo, counsel to the fourth defendant (Akano), told NAN that the court which is the last hope of the common man had acted well. “The bail that was granted is constitutional and warrantable.